Presently, Institutions Deemed to be Universities are regulated by the University Grants Commission (UGC) as per the provisions of UGC (Institutions Deemed to be Universities) Regulations, 2016. As per the Regulations, there is a provision for mandatory intensive external review of every Deemed to be University once in every five years based on the criteria prescribed by the UGC from time to time. Only those Institutions Deemed to be Universities are not reviewed by the UGC which are accredited with highest grade by National Assessment and Accreditation Council (NAAC) or all their eligible Courses are accredited with highest grade by National Board of Accreditation (NBA) for two continuous cycles. The review of such Institutions Deemed to be Universities can be done by the Institution itself through external peer review mechanism. Since there is a mandatory provision for reviewing of every Institution Deemed to be University, the Ministry does not interfere in conducting review of these Institutions. 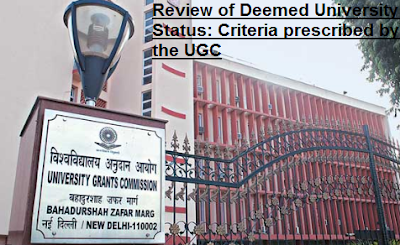 However, in case of Category ‘B’ Institutions identified by the Tandon Committee, the Government has asked the UGC to see whether the deficiencies pointed out by the Committee have been rectified while carrying out inspection as per the mandatory requirement of UGC (Institutions Deemed to be Universities) Regulations, 2016. For Category ‘C’ Institutions as identified by Tandon Committee, the UGC has been asked to see during inspection that whether deficiencies have been rectified and that the Regulations are being adhered to. Presently, Institutions Deemed to be Universities are regulated by the University Grants Commission (UGC) as per the provisions of UGC (Institutions Deemed to be Universities) Regulations, 2016. As per the Regulations, there is a provision for mandatory intensive external review of every Deemed to be University once in every five years based on the criteria prescribed by the UGC from time to time.